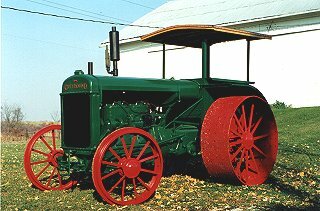 This is a photo of my tractor called Greyhound made by the Banting Mfg. Co. of Toledo, Ohio. There are only two year with a Greyhound cast in the radiator. My tractor was built and shipped new in 1929. The last tractor was made in 1929. The later model has Banting Machine Co. cast in the radiator. The only year I know is in 1930 before the company liquidated at the end of 1930 prior to contracting with Allis Chalmers. I have a lot of history on the Greyhound and am the only man who does in research in the USA. There are only 11 known Greyhound tractors in existance in the US!